That was President Donald Trump on Oct. 21 pledging to remove the U.S. from the 1987 Intermediate Nuclear Forces (INF) Treaty, which banned all nuclear weapons with ranges from 310 and 3,420 miles. “Russia has not adhered to the agreement. This should have been done years ago,” Trump added. Both the U.S. and Russia have said each side is in violation of the treaty with the development of ground-based missile systems banned by the treaty. 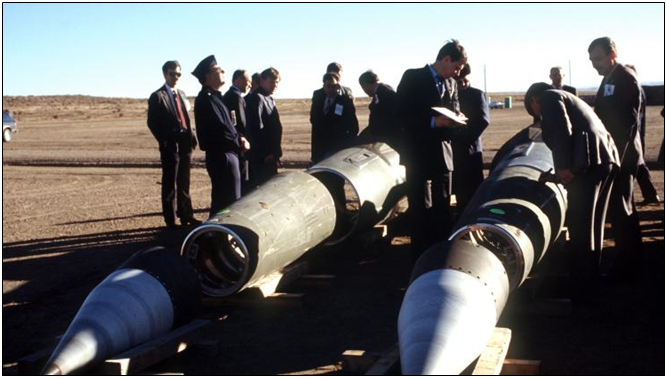 At the time of its signing by Ronald Reagan and Mikhail Gorbachev, the INF Treaty was the first ever nuclear arms reduction treaty in the nuclear age. It laid the groundwork for the 1991 Strategic Arms Reduction Treaty (START). Both of those in turn built off of the Strategic Arms Limitation Treaties of the 1970s and the Nuclear Nonproliferation Treaty (1970). Taken together, these treaties are the legal, agreed-upon basis for modern arms control. When new powers, say, Iran or North Korea, attempt to develop nuclear weapons, the argument against them doing so is that it violates the arms control regime currently in place and therefore constitutes a de facto threat to international strategic stability. Away goes that regime, and the risk is that so does the rationale for expecting other nations to comply. All that’s left is the threat of force, and in the case, of nuclear weapons, mutually assured destruction, to keep the peace. The truth is, and on the other hand, that may be all that keeps the peace anyway. The rationale for resuming arming ourselves or just modernizing the nuclear missile force — in this case, with intermediate range ballistic missiles — would similarly be to keep the peace. If Russia is going to be building these weapons anyway, the U.S. must keep parity. Any imbalance strategically, where one side builds but not the other, is also destabilizing. If the breach of the treaty cannot be cured with diplomacy then it must be cured by arming. The alternative presented to Trump is weakness. To pretend the treaty is not being violated when clearly it is. Trump has no choice by to scrap the treaty, or threaten to scrap it, in order to restore the balance. Of course, it is Trump and so the art of the deal is always on, begging the question whether Trump is attempting to bring Russian President Vladimir Putin into a wider discussion on nuclear arms control. Already, Trump and Putin will now be meeting in Paris next month to discuss the end of the treaty on the sidelines of a gathering to commemorate 100 years since the end of World War I. After all, ultimately cooperation on strategic arms control may be essential on the questions of Iran and North Korea. Deterrence is less effective when satellite powers believe they are protected by Moscow or Beijing and instead act with impunity. The dangers of nuclear proliferation and conflict are self-evident, but arms control agreements are only as good as the parties to those agreements. There has to be capacity and willingness to follow through on commitments that are made. Without that, and the agreements are not worth the paper they are printed on. Which might be just the right message for Trump to be sending to North Korean leader Kim Jong Un at this time. Kim can still be his own man and follow through on his agreement with Trump denuclearizing the Korean peninsula. But he needs to see what the alternatives are that are less desirable. By threatening to scrap the INF Treaty, Trump is signaling that non-compliance with any new agreement could result in consequences, including termination of the agreement. To keep the deal with Kim, in this case, Trump may have to show a willingness to say no deal. After all, why should Kim take a new arms control agreement with the U.S. seriously if we do not properly account for flagrant violations of existing arms control agreements with Russia? Here, Trump is calling Russian President Vladimir Putin’s bluff. How Putin responds could tell us if it’s time to talk or not on wider arms control, and more immediately it shows Kim that Trump means business.